In the recent weeks my skin has had a bit of a mare, from having the most painful blemishes that just keep reappearing every few months, to being the driest it has ever been due from my recent fleeting trip to Paris that dried my skin out like no other trip has. 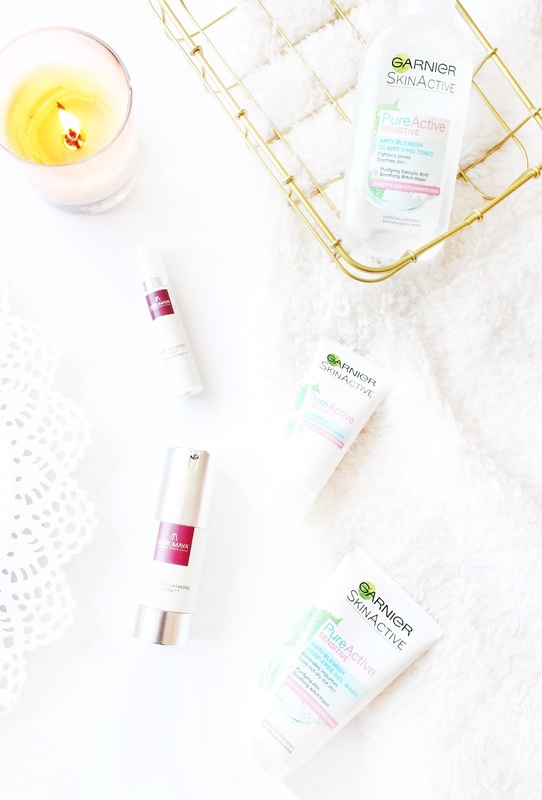 With that being said I have recently been trying out a few new skincare bits that I've found have really helped get my skin back to it's normal state, and I thought i'd share my thoughts on those products, and why I've been loving them. As I've mentioned in a few previous posts, I tend to not really have a skincare routine as such as I just found my skin couldn't handle so many different products being applied to it at all at once, and I much prefer using products as and when I need to. Don't get me wrong I still cleanse my face everyday and slather it with some serum and moisturiser but other than that I try to leave it be. Now I don't really suffer with acne anymore, but I do still get a few blemishes here and there of which are very painful so I always turn to products that I know are going to work at fighting those pesky spots. I've recently been trying out the new Garnier #PureActive range which is specifically formulated for those with sensitive skin, which I definitely do suffer with from time to time and I always love when brands consider us people with sensitive skin, as some products on the market are just too harsh for my skin to handle. So when I woke up a few weeks ago to a few new friends on my face I instantly reached for these products, as i'd been saving them to try out. Firstly in the range we have the Garnier Pure Active Sensitive Anti Blemish Soap Free Gel Wash* (£4.99), which a new formula of zinc and witch hazel to not only be gentle on the skin but to also rid you of any unwanted blemishes, without drying out the skin. Now for me I often find gel washes to be unbelievably drying on my skin, so when this boasted that it doesn't dry out your skin I was really intrigued to see if this was true. Safe to say I absolutely love this face wash, as it's great to use as a general cleanser to stop any new spots appearing but it also soothes and current blemishes whilst leaving my skin feeling smooth and hydrated. Continuing on from giving my face a good cleanse, if I have got any blemishes I've also been using the Garnier Pure Active Sensitive Anti Blemish Clarifying Tonic* (£4.99) , which I've been using as a toner almost, but just applying to the areas it needs once or twice a week and so far it's really helping to clear up any unwanted blemishes. When my skin is having a bit of mare it loves nothing more than a good moisturiser, and I've been using two different products in rotation so that my skin doesn't get too used to them. Another product from the Garnier range is the Garnier Pure Active Sensitive Anti Blemish Moisturiser* (£5.99), which my skin has been lapping up, as it leaves it not only moisturised but i've also noticed such a difference in the appearance of my blemishes and scarring thanks to this product. Another product i've been using around this one is the Merumaya Retinol Resurfacing Treatment* (£33.50), which i've spoke about once or twice but this treatment is like no other! It's essentially a really heavy duty moisturiser, but it feels so light on the skin which is what I personally love about this product. It's vitamin A enriched formula helps to boost cell turn over, thus removing any dead skin from the top layers of your skin and too thicken new skin cells, all whilst providing amazing moisturising to the skin. Finally the last product that i'm praising as my hero product is another from Merumaya, and this is the Merumaya Concentrated Spot Treatment* (£14.50), which i've been applying directly onto any new blemishes in order to help soothe and clear up any spots. I notice that if I use this of an evening before I go to bed, my spots are so much less noticeable come the morning as it helps to reduce any inflammation and as i'm a nightmare for not leaving my spots alone, i've noticed this helps to reduce any scarring that I may get. So those are a few new skincare products that i've been loving to specifically target my skin and any blemishes that i'm dealing with! What are you favourite spot banishing skin care products?